The DC2012 is the next progression from our highly successful DC99-II commentary box. Designed from the ground up, the unit has a sturdy two piece steel chassis with custom manufactured protective handles. Facilities have been greatly improved with the highest quality audio a prime objective. The DC2012 has a paper white liquid crystal display with six control push buttons to facilitate intuitive adjustment of the unit's various settings. It may be easily locked to prevent operator adjustment. Including three top quality microphone amplifiers with built in limiters, separate line level microphone outputs with a mixed output facility, four lazy talkback outputs and a total of ten available monitoring inputs the DC2012 is a very flexible commentary box. The DC2012 includes three digitally controlled microphone amplifiers with magnificently low distortion and a really natural sound. Microphone amplifier gain is adjustable in 1dB steps from +15dB to +70dB or may be set to +5dB. Each microphone amplifier has an individual XLR electronically balanced output (transformer output available as an option). Each line level microphone output also has a built in limiter with adjustable threshold from off to -20dBm. There is also a mixed output available with its own limiter and selectable Comm. A/Comm.B/Guest mix. 48 volt phantom power is available for each microphone amplifier and selection is shown on a front panel red LED for each of the three inputs. The unit has four Lazy outputs ( redirected audio) which silently take the commentator microphone off the air and re-directs the microphone audio to any of the four outputs. These outputs are common to both commentators with each commentator having four individual buttons. These outputs are electronically balanced (transformer output available as an option). Each commentator has a Mic Live switch which can be programmed to just illuminate when the mic is taken off air (by pressing the Lazy talkback buttons) or as a momentary Mic cut (or cough) switch or as a Mic cut with toggle on and off. Setting depends on how much you trust your commentators! 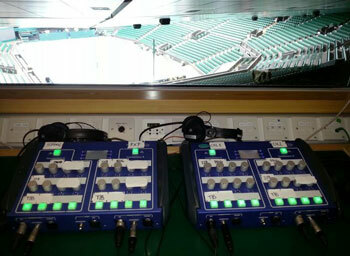 Each commentator has six common audio monitoring inputs with volume controls designated Talkback, Programme, Aux 1, Aux 2, Aux 3, Aux 4. There is also an additional feed of sidetone (himself) and another for the other commentator plus the guest microphone. Additionally there are four more monitoring inputs which may be selected to commentator A or commentator B replacing the first four inputs enabling the two commentators to work to different trucks or on different productions. Every input may be switched via individual user adjustable mini toggle switches to left, right or both ears of the headphones. Headphone monitoring may be a 5 pin XLR connection with both microphone and headset connection or 3 pin XLR microphone input with TRS jack stereo headset connection. This jack socket is suitable for use with both 1/4 inch stereo and 316 (PO) jacks. The guest has his own headphone feed with a mix derived from commentator A. Individual commentator A feeds may be switched away from the guest so if just, for example, a programme feed is required for the guest. All audio monitoring inputs are transformer isolated as standard and this is normally sufficient to prevent any earth loop problems. Output transformers are available as an option. The headphone amplifiers go loud, capable of 500mW of audio with low distortion. Please ensure you have audio level limited head sets if required. The rear panel MIL26 connector carries the four separate additional audio inputs or may be configured to carry four common audio inputs to the two commentators. Two commentator outputs and a lazy output (or two lazy outputs on 8 pair cable) are also available so, on less complicated productions, it is possible to connect the DC2012 with just one multicore cable. 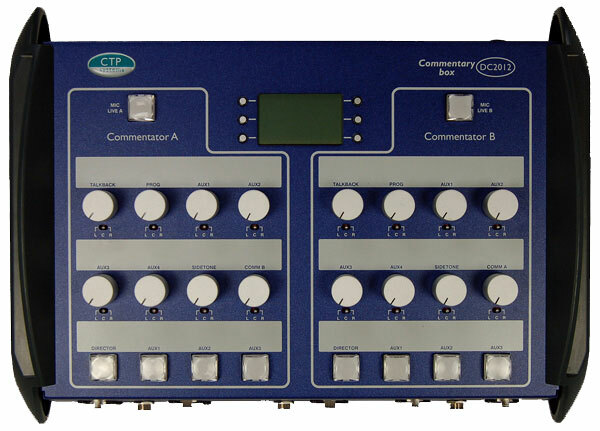 The DC2012 has a built in tone generator which can be set to identify any (or all) of the audio outputs. 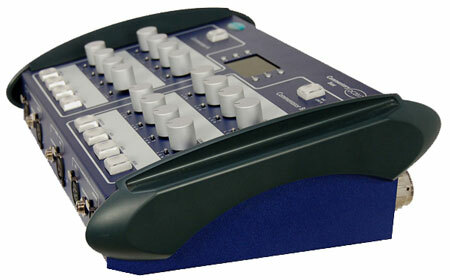 Perfect for setup and identification of the audio channels with a different tone identification on each output. Lots of lights flash when it's on so it's not easy to forget. The DC2012. Great looks, exceptional facilities, impressive sound.